Lots NEW! 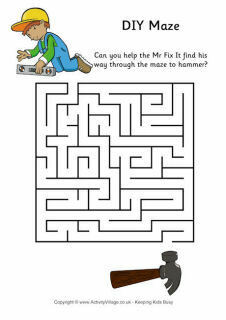 Here are some puzzles and mazes especially for Father's Day, but fun all year round too! Have a go at this word sudoku puzzle for Father's Day. Instead of the numbers 1-6, fit in the letters of the word FATHER. Have a go at this boggler puzzle for Father's Day. Kids can challenge themselves or try it as a group activity - to see who can get the most points. Here's a colour by numbers page of Dad on his way to work. We have US and UK versions available. Solve the cryptogram to find the Father's Day message. A great activity for children and fathers to do together. How many smaller words can you make out of the letters in HAPPY FATHER'S DAY? Challenge yourself or race with a friend. In our Father's Day word search find the names for Father in many different languages from all over the world. The second of our Father's Day word searches is tricky! How many times can you find the word Father?